Netherway Workshop is recent pin maker and has hit the scene with some awesome pins this year. Their recent release was too cool to pass up for featured pin of the week! Meteor Bill should be instantly recognizable to any Mario or Nintendo fan. Most of us have probably met our end more than a few times against a bullet bill and this pin helps us remember one of Mario’s awesome foes. We love the artistic abstract treatment to give him the look of being in motion. This pin is a great addition to the growing Nintendo inspired enamel pins out there! 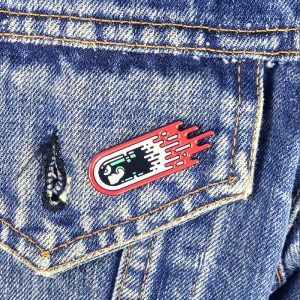 Meteor Bill soft enamel pin comes in at a standard 1.25” length. Meteor Bill features 4 color fills and and comes with dual posts. This enamel pin is also a limited edition of 100 so don’t wait too long or you’ll miss out on this awesome take on the classic bullet bill. You can purchase currently for just $10.00. Make sure to visit Netherway Workshop’s store and website to check out their other awesome pins! We expect more amazing work from them in the future and we’ll be on the lookout!